Earlier this year, I submitted comments to the US Copyright Office (“CO”) in response to the CO’s study on an important issue to musicians: the right of attribution and what are known as “moral rights.” This is an abridged version of those comments. If “digital music” is ever going to provide us a reasonable economic future, it will be based on metadata. Thus, I urge every musician and performer to demand that their metadata be kept in-tact, and not be destroyed. 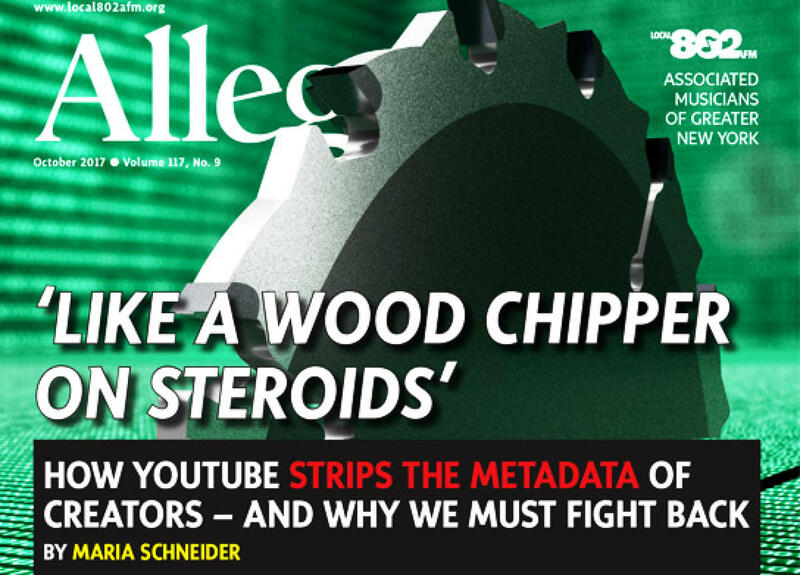 YouTube is intentionally stripping off creators’ metadata that includes our moral rights of attribution and integrity. Essentially, YouTube is herding music and musicians into its platform, stripping away our identities, and then rebranding our works with the hot iron of its own system. When I create an MP3 file with my music on it, it is a digital file that contains certain specific information. By ISO standard, those files always include specific information about who owns the copyright, the date of the copyright, etc. That sort of information is specifically covered by section 1202 of the DMCA. Section 1202 defines a term, “Copyright Management Information,” which includes: the title, the author, copyright owner, performers, any terms and conditions covering the work, etc. “CMI.” Every MP3 file has this sort of CMI information embedded in the file. For instance, most MP3 files have specific “metadata containers” called ID3v1 or ID3v2 tags (they contain 80 different fields). These standardized containers are well known to contain the CMI, and are an integral part of any digital music file. YouTube knows this well. However, when a YouTube user uploads an MP3 file onto YouTube, that CMI metadata gets stripped away. When a YouTube user wishes to upload an MP3, he/she must first “convert” it into a MOV fil, which strips the CMI. And even if I manually add back my CMI metadata to the MOV video file, when the video is then downloaded from googlevideo.com, the added CMI metadata isn't there anymore – it’s been stripped away by YouTube. Section 1202, which is part of the DMCA, prohibits a company like YouTube from removing or altering the CMI without the copyright holder’s permission. Congress was not messing around with this law. To strip CMI metadata “knowingly,” or to distribute such works knowing CMI has been stripped, is potentially criminal under the law. The stakes are extremely high for YouTube, because if YouTube violates section 1202 with its intentional policy of stripping CMI, then it is not entitled to the section 512 “safe harbor,“ upon which YouTube has built its entire empire. YouTube might initially try to point the finger of blame at its army of billions of users, by saying that, “well gosh, that CMI metadata stripping is done by our users, who convert MP3 files to MOV files, using Microsoft Movie Maker, or Apple iMovie; so don’t blame us, blame them.” But YouTube is smarter than that. They know that all of the software programs its users rely on, like iMovie, have very clear restrictions on what that software can be used for. The license terms state that movies created by a user are for individual, personal use only, and are not for commercial use. But YouTube is accepting billions of uploaded music “videos,” knowing full-well that its users did not have the necessary license rights to commercially distribute those works on an international basis. Well, YouTube might then take the position that: “Oh, golly gee, maybe we do induce the systematic stripping of that metadata, oops, but we still have the right to hide in the 512 safe harbor, because section 512(c) allows us to do what we need to do in order to store information ‘at the direction of’ our users.” Though that’s what YouTube’s high priced lawyers might claim, the simple truth is that regardless of what the user does or doesn’t do, YouTube, on its own initiative, still strips away that valuable CMI metadata. And to add insult to injury, YouTube’s robots re-encode the video with new metadata to now say “Produced by Google.” You can almost hear the sear of the hot iron, as they brand our works with their own technology, name, and metadata. For instance, part of the metadata contained in the ID3 tag that gets ripped off like a hide off of an animal, is the very valuable ISRC and ISWC codes. These are special codes affixed to the MP3 file that allow our recordings to be identified, so we can be paid. Without the ISRC code, services like Spotify would not know who to pay. And an ISWC code is needed to distinguish a particular piece of music from other related music (e.g., arrangements or adaptations, etc.). In essence, the ISWC is itself a kind of unique fingerprint. So when YouTube encourages and induces these codes to be stripped off (or otherwise itself strips off these codes), it is eliminating the ability for anyone accessing the file to know or respect this important information. YouTube is directly interfering with our rights to display CMI through “standard technical measures.” The copyright law identifies a “standard technical measure” as “a technical measure used by copyright owners to identify or protect copyrighted works ...“ Obviously, the actual ISO standard for MP3 files, is the epitome of such a technical standard. This is exactly what Congress intended by including this provision. So when YouTube denies us the right to avail ourselves of that CMI, and pushes a business model and technology platform that actually strips it off, then YouTube should no longer be allowed in the safe harbor. In my submission to the CO, I urged the CO to issue findings that companies who strip CMI from files as those files are created and uploaded for international distribution are violating the moral rights of the authors, and are in violation of section 1202 of the DMCA. Companies who violate section 1202 and/or 512(i) of the DMCA are not entitled to the benefits of the safe harbor. In this abridged version, I urge my fellow musicians to insist that CMI metadata identifying them or their collaborators and performers be preserved on all digital platforms.